If you’re planning a party, planning a menu is half of the fun. People often come for the party but they stay for the food, so picking food is an important part of party planning. You might feel pressured to serve unique dishes to impress guests but common party foods are often a guaranteed a hit. Regardless of age, people seem to just love pizza. Pizza is a comfort food, and in recent years, it’s actually become a “trend” of the mainstream media. Pizza is delicious, affordable, and easy to serve making it a great “go-to” party food” Order a sheet pizza or two from your favorite pizza joint, wait for it to show up on your doorstep, and serve. It’s that easy. Grocery stores always have ready-to-go vegetable trays for a reason: they never fail. If you’re looking to serve smaller snacks, and you’re hoping to keep it healthy, a veggie tray is your best option. Kids often enjoy bite-sized vegetable and parents will be grateful there is a sugar-free, lighter option. Tacos are another food that have been in the spotlight for years with a huge fan base to prove it. Having a taco bar will give your guests plenty of options because tacos can be served in many ways. You can serve tacos with meat, beans, banana peppers, guacamole, and the list goes on. From hard shell to soft shell and shredded cheese to nacho cheese, tacos will leave all guests feeling grateful they came. As adults we often outgrow a lot of things but ice cream isn’t one of them. All of your guests will enjoy a cold scoop of ice cream paired with a slice of birthday cake. You can easily serve a variety of ice creams but consider having the classics on hand: chocolate and vanilla. Pair ice cream with a variety of toppings such as chocolate sauce, sprinkles, and crushed candy bars. 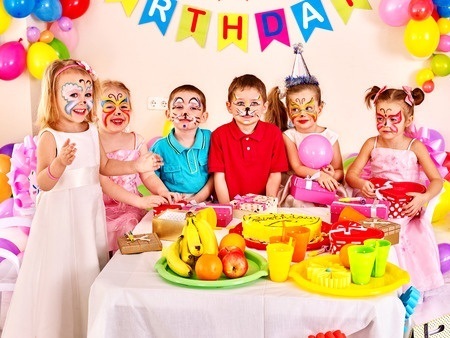 To make any party a big hit, you need plenty of party activities to entertain your guests such as pony rides, bounce houses, and face painting. Contact New Joy Farm today to get started.